I’ve recently made the decision to learn some drawing skills. Specifically, I wanted to start with a tablet right away so I could avoid having to re-teach myself to using a tablet instead of paper. However, I still consider it important to be able to shift and rotate the canvas with my hand, so I went for a Wacom tablet with touch. Most artists I knew swear by Paint Tool SAI, but that just happens to be one of the applications not fully supported by Wacom’s drivers (pressure works fine, but touch is a no-go). Luckily, Wacom’s drivers are pretty flexible and you can easily modify them to support your favorite application. Here’s a guide to enable pinch-zoom, panning and two-finger rotation in Paint Tool SAI and Manga Studio! If you’re not a power user, you might want to scroll to Wacom Driver Settings for a moment before starting to see if you feel up to it, since it requires some Control Panel operations and XML editing. For the rotation gesture to work in Paint Tool SAI, we need to set up some keyboard shortcuts than can then be simulated by the Wacom driver. First, tick the "Alt" check box at the upper left, then locate the entries for F13 and F14 on the left and assign "Rotate View 90° Clockwise" and "Rotate View 90° Counter-Clockwise" to them (they may be named differently and the "90°" are just a translation error). Make sure you pick "Rotate View", not "Rotate Canvas" on the right! Scroll down to the Wacom Driver Settings section or continue with the next section if you want to set up Manga Studio as well. 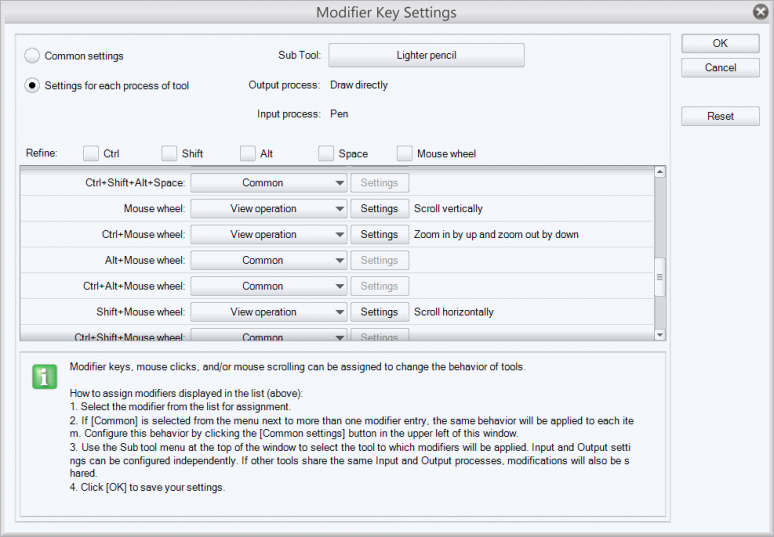 You’ll find the keyboard shortcuts window in the menu right above the modifier key settings from the previous step! Normally Manga Studio rotates by 15 degrees per press of the rotation key. That’s a bit rough, so we’ll change it to 10 degrees (we could go even lower, but then manga studio wouldn’t be able to catch up with the two-finger rotation gesture and the canvas would take several seconds to reach its final rotation even after you lifted your hand). This is where it gets a bit tricky. Follow the steps exactly to avoid messing up your Wacom driver and requiring a reinstall! Keep the services manager window open, we’ll need it again in a moment! Now hold the Ctrl and Shift keys pressed and click on it. You should get the well-known prompt asking whether you want to allow Notepad to make changes to this computer. Say yes. Now a second Notepad window will have opened right on top of the first one. This second window has administrator privileges. Close the first window below it (be careful not to get confused about which is which :)). All that’s left to do is to open your AppGestures.xml file. Click "File" -> "Open", then in the file selector window, go to C:\Program Files\Wacom\Tablet (depending on your Wacom product, instead of Tablet the final folder could be called Pen or something). Because AppGestures.xml does not end in .txt, you’ll have to change your view to show "All Files (*. *)" in the lower right to see it. Once you’ve opened your AppGestures.xml, scroll down a bit (maybe until you see <displayname>Adobe Photoshop</displayment>). As you can see, the file contains blocks of information, always starting with the opener <ArrayElement> and ending with a matching </ArrayElement>. It should fit in neatly with the other blocks in the file. Make sure the block you pasted is not inside another <ArrayElement> block or something. Check twice that the new block correctly lines up with the others, then save and close your AppGestures.xml. Switch back to the services manager window you kept open in step 2 and start the Wacom service again by clicking on "Start the service" or using the play button in the toolbar. Congratulations, if you open up Paint Tool SAI or Manga Studio now, you should be able to pinch-zoom, two-finger rotate and pan the canvas, all via touch and without moving your hands away from the drawing area! Hello. I have been looking for something like this since I bought my Windows 8 tablet one year ago;but this only works with Wacom branded devices (cintiqs, intuos, bamboos etc) isn’t it? I tested it on my Asus Vivotab tf810c tabletpc with Wacom penabled tech following all your steps I can’t make it to work. When I try to pinch and drag, the cursor changes to the cross of the move tool, but nothing happens. Anyhow thanks for your great effort, many Wacom users will appreciate this. It’s a feature of the Wacom driver, so if your Vivotab uses it (i.e. the AppGestures.xml file existed), it should work. If the cursor changes in your case, maybe the key bindings don’t match up with the ones in the XML code? Or you might have something running in the background (eg. a VoIP client) which captures some of the keys. Worked like a dream, your a star! Thanks for the tutorial. The pinch and zoom works but I can’t get it to rotate in Sai. If you don’t mind my linking to it, Mario Kluser at youtube /watch?v=12VHCIswy2Q has a solution for this. Basically, go into your pen tablet settings and reprogram one of the buttons on the pen to be shift + spacebar. This is sai’s shortcut mode for rotation. 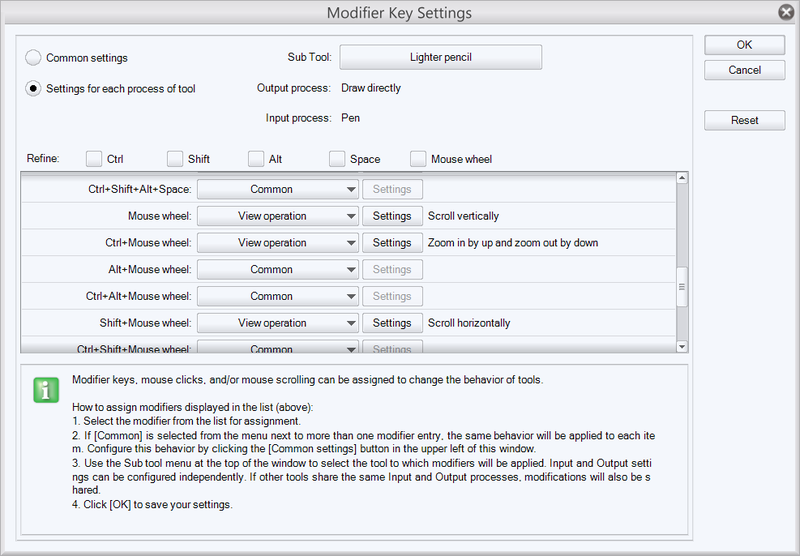 You can set it up so that this shortcut only works in Sai and in all other applications the button will behave normally. It was really bugging me that I could not pan using the touch gestures in Manga Studio, but it’s all fixed now. Thanks for the awesome tutorial! This worked really well! The only issue is that Manga Studio step 1 says “Alt + Mouse Wheel” to scroll horizontally, but the screenshot shows “Shift + Mouse Wheel” which is correct. For some reason I can’t get this to work on my Surface Pro 2. The machine runs Windows 8, uses the Wacom Feel Driver, and the appgestures xml file is there (different path, but it’s there c:\program files\tablet\isd), but for some reason I can’t quite get it to work with Sai. Any thoughts? Hmm, weirdly enough when I do a rotate gesture, Sai’s little button press indicator at the bottom right shows that Ctrl is being used. I copied the text exactly,and even double checked the line about rotation ( ) so I’m not even sure what’s going on. Any insight you can offer would be greatly appreciated! Tried and re-tried, checked and double checked, doesn’t work with the Cintiq Companion. Guess I’ll have to stick with Art Rage. frrrooowwwnnn. Thank you so much!! It worked like magic on my intuos pro! So much easier to use SAI now. Thanks for this. For the life of me though, I can’t get SAI to rotate counter-clockwise. Otherwise, the rest worked.